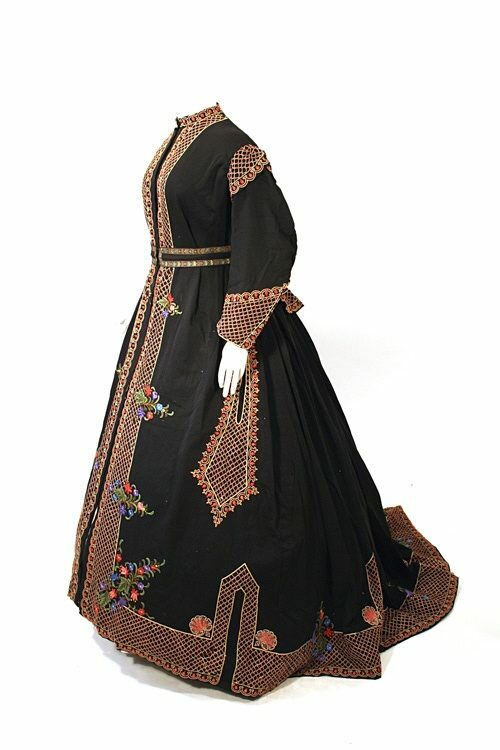 A hand written tag found in one of the pockets of this embroidered black wool wrapper reads, “Mother’s black embroidered dressing gown – To go to Tom Waterman at my death -“. Penciled at the top and bottom it also reads “Belonged to Jane Cameron Campbell (Maudies’), about 1870”. Tom Tileston Waterman was a nephew of Jane Maud Campbell and a noted historical architect who was instrumental in the restoration and preservation of Colonial Williamsburg and Henry Francis du Pont’s Winterthur.